Grover is a brave dog, but right now he’s cold, wet, hungry and afraid. After escaping from his owner’s yard in a thunderstorm, Grover is taken to a local animal shelter. The people there are kind, but Grover isn’t sure he’ll be allowed to stay. By buying this book, you are supporting the work of The Sydney Dogs and Cats Home. 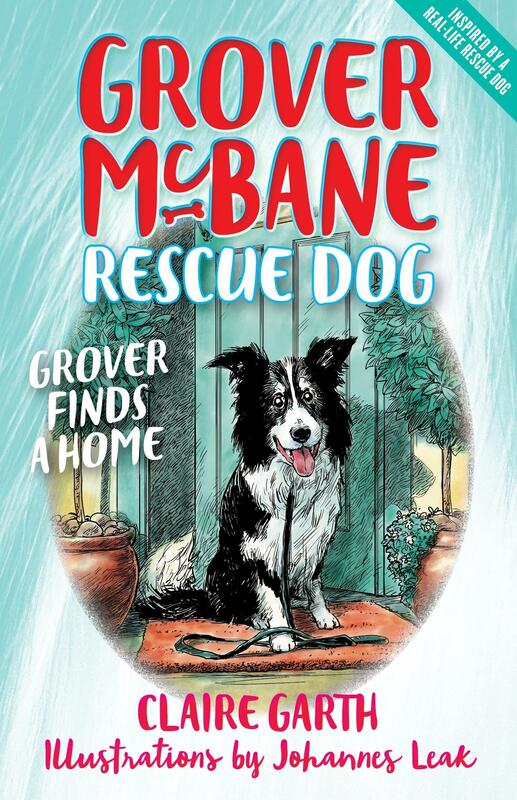 The Grover McBane, Rescue Dog series is for junior readers aged 6–9 years. Based on the author’s own Border Collie dog, this first title, Grover Finds a Home, tells the story of a dog whose owner doesn’t take care of him. Grover is hungry, lonely and afraid when he escapes one stormy night. He is picked up by the local ranger, and taken to a shelter. I loved that the story was told in Grover’s voice. It is also educational as it explains what happens to animals who are rescued, including a vet check and Grover’s most hated thing – a bath! The story has a very happy ending and lots of funny parts, including conversations between dogs! Perfect for children who love animals, and anyone who enjoyed the Juliet, Nearly a Vet series. Grover McBane, Rescue Dog is a new early-chapter-book adventure series about a cheeky but brave rescue dog called Grover McBane.